Craig Johnson and his staff make it a priority to break the stigma of how bill collectors are often viewed. 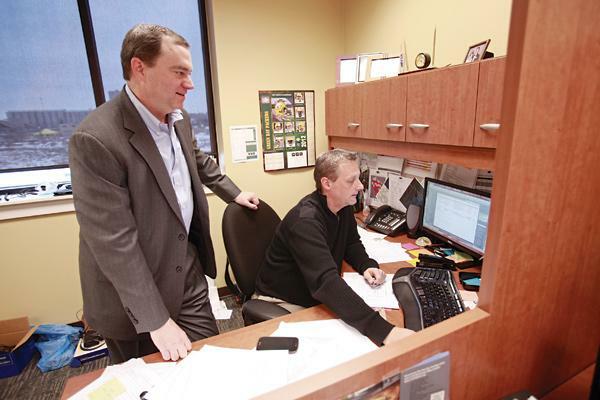 “The perception of the industry is the collector with the baseball bat at the door, and we are working really hard to change that,” said Johnson, principal and co-owner of Professional Placement Services LLC, Milwaukee. Johnson and his wife, Irina, own the 15-year old collection agency, which has about 180 clients in the medical, government, banking and retail industries. “Being diverse has helped us grow,” Johnson said. PPS had a banner year in 2012. Johnson wouldn’t reveal specific financial results, but said revenue jumped 138 percent in 2012 over 2011 and the company picked up 40 new accounts. Six new employees were hired in 2012 and Johnson expects to bring another 10 people on board in the first quarter of 2013. Currently, the firm employs 35 people. Johnson believes people are paying more attention to their credit in hopes of getting better rates on loans or when they refinance their homes. “Right now we are very busy because people are planning to use their tax returns to pay off debt — that is a good sign the economy is healing,” Johnson said. In 2007, Johnson moved his business from Milwaukee’s 3rd Ward to a 16,000-square-foot building he purchased in the Menomonee Valley. He spent nearly $1 million to buy and renovate the former Falk Corp. headquarters, which was built in 1929. Johnson received $650,000 in New Markets Tax Credits from former M&I Bank’s community investment division and borrowed $300,000 through the Milwaukee Economic Development Corp. to restore the building. PPS has its office at the site on North 12th Street and West St. Paul Avenue and rents space on the first floor to Sign-a-rama. PPS saw business drop about 20 percent in 2008. By the following year, the company was back on track and grew at a steady pace through its strong 2012. During that time, Johnson said new processes and technology were put in place, which boosted business. The company invested about $50,000 in a new automated dialing system, which increased business about 20 percent. The company, which dials about 35,000 phone numbers daily, also started working with new software that makes it easier to track down phone numbers of debtors. Mentoring became a priority in the PPS culture as Johnson expanded his training program and implemented a mentoring system, which he said improved business and made employees more efficient. Employees’ calls are recorded as they retrieve bad debt and at the end of each month calls are rated. The staff is given incentives based on the quality of their calls. Prizes are given to employees who receive compliments. There’s a drawing each month for prizes such as a Kindle Fire, big screen televisions and gift cards. Johnson said there are a lot of good people in bad situations and his team works to understand their stories and help them get out of those bad spots. “You aren’t going to get someone to pay a bill when you don’t listen and offer respect,” he said. Many of the firm’s clients are able to keep their costs down when the bad debt is collected instead of having to pass those costs on for their goods or services. Others, like Dr. Clay Frank, a partner with Integrated Spine Care, Wauwatosa, said he doesn’t have the option of raising prices. Frank said, in his case, money recovered by PPS translates to more time with his family and less time at the office trying to make up for the loss. Frank and his partner, Dr. James Hollowell, have recouped over $150,000 of bad debt in the past eight years contracting with PPS. Dan Priebe, who lives in Jackson, said he recently worked with PPS to settle a medical bill. Priebe had never been approached before by a debt collection agency and was relieved he was able to set up a plan that would prevent the debt from being recorded on his credit report.